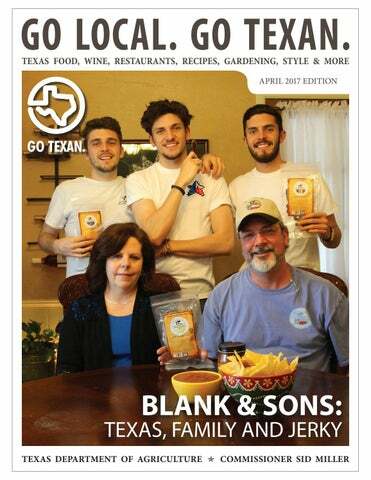 BLANK & SONS: TEXAS, FAMILY AND JERKY STARTING A BEEF JERKY BUSINESS JUST KIND OF HAPPENED FOR DAMON BLANK AND HIS FAMILY. AFTER TRANSITIONING OUT OF A RESTAURANT BUSINESS RUN THAT LASTED 14 YEARS AND ANOTHER 8 YEARS IN THE FOODSERVICE INDUSTRY, BLANK TALKED TO HIS WIFE, TAMMY, ABOUT THE NEXT STEP TO TAKE. HE JUST HAPPENED TO BE MAKING SOME BEEF JERKY THAT WEEKEND IN THE KITCHEN. Now Blank and Sons is sold in H-E-B stores all over Texas. They were a finalist in last year’s Quest for Texas Best contest and recently sent their first truckload of products to the H-E-B warehouse. This was a big moment for the family business. Blank and Sons is ready for the challenge, and they can’t imagine running the business anywhere else but Texas. • First Beef Jerky: The original recipe — a traditional beef jerky. Good, clean, bold beefy flavor. • Alamo Black Pepper: The original flavor with the addition of some nice black pepper spiciness. • Texas Heat: Bold, with some mild heat that will give you just a little tingle on your tongue. • Texan Spirit: Unique flavor If you like beef jerky — and who different from the other three. doesn’t? — Blank and Sons has Enjoy the depth of flavor while a four distinct flavors to choose gradual heat builds as you chew. The company also branched out and now produces a brand of salsa called Raging Rooster Salsa. specific recipe until now. Damon believes it’s the best salsa out there. turf from beef jerky thieves. to let people know that we are making beef jerky and thought that would be a catchy and fun way to communicate that fact.â&#x20AC;? What could be more Texan than celebrating this entrepreneurial and funloving spirit? MPANY: NUTS FOR YOU Some people say, “Never judge a book by its cover,” but those people must have never walked into a large retail bookstore and seen all the hundreds and hundreds of books hoping for just such judgment. The packaging often sells the contents. Picosos Peanut Company goes the extra mile with their packaging, but it’s not just because it looks nice. “We spend a little bit more money on our packaging,” Sylvana Mery said, the company’s general manager. “You can get cheaper packaging — a corrugated can — but you have to flush it with nitrogen for freshness. Our can is a vacuum-packed metal can. pistachio, macadamia, almonds, Brazil, corn nuts, pecans, pepitas (pumpkin seeds), sesame and sunflower seeds. For more information, visit the Picosos Peanut Company website. husband and wife team, Brian and Amanda Light opened Ronin Cooking “on a wing and a prayer” at a farm they purchased in Bryan. member himself. Now, his role focuses solely on marketing and distributing the High Ground of Texas’ name across Texas and the nation. “I’m always looking for leads and trying to get our name out there,” Carter said. 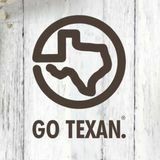 “We really want to give support to our member cities, and utilizing our website and programs like GO TEXAN makes it easier.” Carter said that the friendships formed within the West Texas region are like no other. Even though a major challenge of the High Ground of Texas is that the members are spread out, the comradery between the cities makes that burden a little lighter. pring is in full swing in Texas and there’s plenty to be done in your garden, but hopefully graced with bright and sunshine-filled days and nice, warm temperatures to make it pleasant. Our friend Neil Sperry has some good tips to share for this month and going into May. Hand-water every couple of days for the plants’ first entire summer, as sprinkler irrigation will not be sufficient. Perennials are a good option — especially if you mix many types for a spring-until-fall blooming season. Be sure you know their mature sizes, colors and blooming times to ensure the most attractive arrangement. is a good time to plant warm-season vegetables, like tomatoes, peppers, corn, beans, squash, cucumbers, melons and eggplant. For the tomatoes, however, think small and mid-sized varieties, as large-fruiting tomato varieties do not produce well in Texas’ weather conditions. Early May is an ideal time to start planting summer vegetables, like sweet potatoes (in sandy soils only), okra and southern peas. that are developing. They will be next yearâ&#x20AC;&#x2122;s fruiting canes, and the tip-pruning will encourage more compact plants with better branching. The result will be larger fruit of higher quality. Be on the lookout for black spot on roses. The lower leaves will yellow and then develop brown spots Itâ&#x20AC;&#x2122;s also a good before the leaves idea to remove low fall entirely. Apply branches on shade labeled fungicide and trees that cause repeat every 7-to-10 visibility problems or that cast excessive days until summer. shade on turf. Wait until mid-summer to Get out there and prune oaks, however, enjoy your garden! to lesson likelihood Donâ&#x20AC;&#x2122;t forget the of spreading oak wilt real benefits of shopping at a local fungus. independent retail garden center. They If you have peaches know gardening in or plums, thin the fruit early in May to your local area the be 5 or 6 inches apart best. Go Local. GO TEXAN. on the branches. RECIPE: TEXAS SHRIMP AL MOJO DE AJO Hereâ&#x20AC;&#x2122;s another delicious Texas Gulf shrimp recipe from Chef David Garrido. It serves four.